A stroke is a serious medical emergency and a major cause of death and disability all over the world. It occurs mostly in older adults, but can happen to younger adults and even children. A stroke happens when oxygen-rich blood cannot reach the brain cells. Often this is because a blood vessel in the brain becomes suddenly blocked or bleeds. The brain is an oxygen-hungry organ; it needs about 20% of the body's total oxygen consumption, much more than its relative size and weight. When the blood supply to it is interrupted, brain cells suffer damage within minutes and start dying. This can have far-reaching consequences for the body. Some people who have had a stroke will recover fully, while others may experience mild or severe disability that may last for the rest of their lives. Speedy treatment of stroke can be crucial to survival and recovery. For this reason, it is important to know how to recognise early signs of a stroke and react accordingly. In developed countries, a stroke can account for more than 10% of total deaths.1 In recent years, death rates from stroke in developed countries have been falling due to improvements in prevention and treatment. There are two main types of stroke - ischaemic stroke and haemorrhagic stroke. Once brain cells are damaged, they are unable to regenerate, potentially leading to persistent disability and even death. Ischaemic strokes account for about 80% of all stroke cases.1,2 An ischemic stroke occurs when an artery supplying oxygen-rich blood into the brain becomes blocked and oxygen cannot reach the brain tissue. 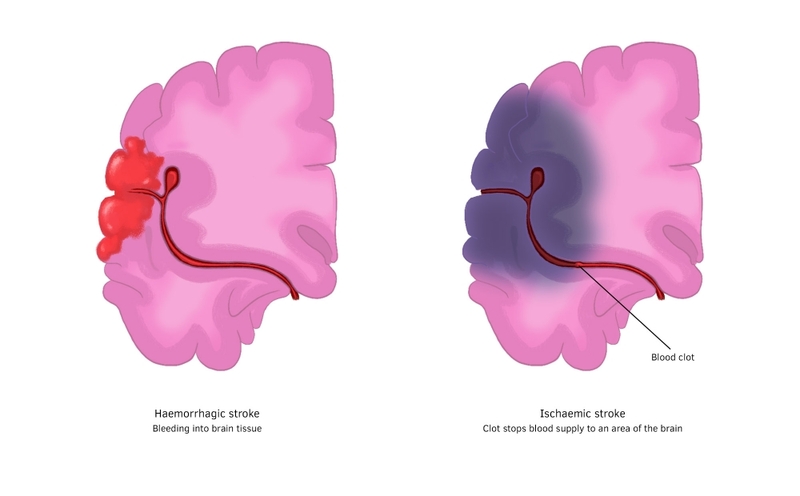 Haemorrhagic strokes account for about 20% of all stroke cases.1,2 A haemorrhagic stroke occurs when a blood vessel in the brain suddenly bleeds. As a result, blood collects in the brain, which causes an increase in pressure that damages brain tissue. Different effects on the brain tissue during a haemorrhagic and ischaemic stroke. A transient ischemic attack (TIA), also known as a 'mini-stroke', is caused by a temporary blockage or narrowing of a blood vessel leading to the brain. A person experiencing TIA will have signs and symptoms of a stroke, but will recover completely within minutes or a few hours. It is a preliminary sign for a stroke in the near future. Recent transient ischemic attack (TIA) or a previous stroke. Since a stroke occurs suddenly, its signs and symptoms can appear very quickly. During a stroke, brain cells are starved of oxygen and begin dying within minutes. The expression 'time is brain' in stroke treatment represents the principle that more brain cells are lost as time passes. The time between the start of a stroke and its treatment is therefore crucial. 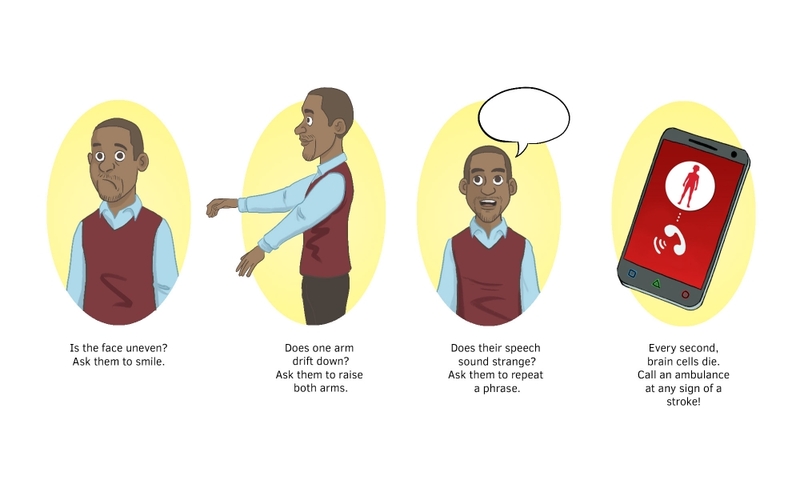 Speech - is the person having problems with speaking and/or understanding speech? Is the speech slurred? Time - the quicker you act, the better the chance of survival and recovery. Call 000, even if the symptoms go away. A doctor will initially suspect stroke based on the symptoms and a physical examination. A brain scan such as a computerised tomography (CT) scan or magnetic resonance imaging (MRI) is needed to identify the type, location, and severity of the stroke. In many cases of stroke, heart activity will also be examined and monitored, as it may be related to heart conditions. Treatment of stroke is broadly divided into two categories - treatment that is given during and immediately after a stroke occurs, and rehabilitation that takes place after the situation has stabilised. Stroke treatment should be done by medical professionals. The immediate concern during a stroke is to restore normal blood flow to the brain. The treatment for the two types of stroke are very different. For an ischemic stroke, treatment involves dissolving the blockage in the artery. For haemorrhagic stroke, the bleeding must be stopped and the pressure on the brain relieved. After the cause of stroke has been successfully treated, the rehabilitation stage can begin. Its general goals are to restore the person to normal function if possible and to prevent complications. The character, length, intensity and outcome of this stage are different for every person. After a certain period, the person's condition is reassessed and the cycle begins again, if needed. People recovering from stroke are encouraged to change their lifestyle - to stop smoking, eat a healthier diet and become more physically active to have a healthy weight. In addition, medication may also be prescribed to treat specific problems. Counselling, to help with any emotional difficulties that arise as a result of the stroke. The rehabilitation process also includes the affected person's family, who will be taught what to expect and how to adapt to the new circumstances. People who have had a stroke are at increased risk of having another. For this reason, after a stroke a person will often be placed on medication that will lower the risk of another stroke happening. Medications to prevent clotting, lower blood pressure and reduce cholesterol levels have been shown to reduce the risk of recurring strokes. A stroke can damage any area of the brain. As such, its effects can vary widely depending on which part or parts of the brain have been affected and to what degree. For those who survive a stroke, rehabilitation will depend on the severity of the stroke. Many people will recover completely within weeks or months. More severe stroke can cause long-term or lifelong disability. Avoiding recreational drugs, such as cocaine, which can increase the risk of strokes. Knowing what stroke looks and feels like can help you recognise it if it happens to you or to others. A quick response will improve the chance of surviving a stroke.